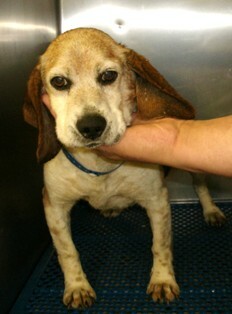 Barney the Beagle crossed the Bridge on May 3, 2011 after only being in his foster home for 10 days. We rescued him from an Ohio shelter, knowing he was a senior beagle and hoping he could spend the rest of his days on the couch, loved as a beagle should be. Sadly, it was not meant to be. The day after arriving at his foster home, we found out that Barney was suffering from severe pneumonia. Trying as hard as we did, we could not save him. We hope that he is finally enjoying himself at the Bridge. You were not a BREW Beagle for very long, but you were still very loved and will be missed. RIP Barney Beagle.